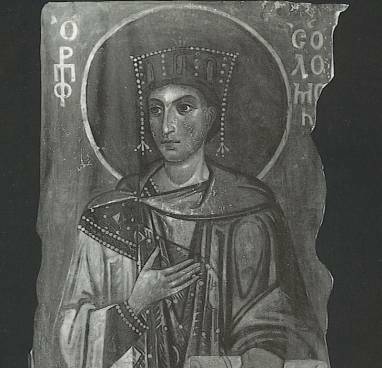 These collars were originally worn by Byzantine clergy and nobility. 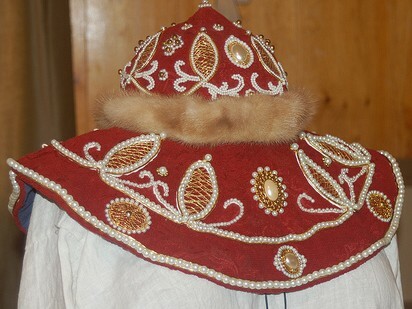 When Christianity was introduced to Russia in the late 10th century; the collars were worn by the Rus clergy and nobility for ceremonial occasions. Less ornate collars were adopted by the merchant class. 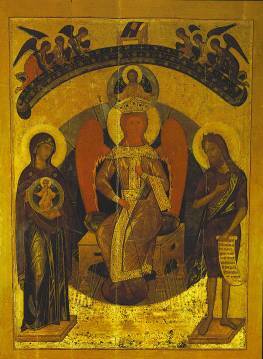 The earliest Rus icons to show these collars are from an 11th century fresco in St. Sophia’s Cathedral in Kiev. 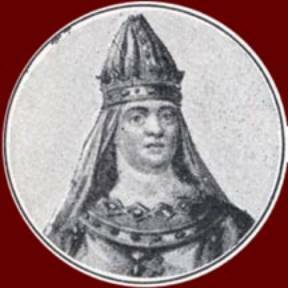 (Novgord, plate 27). The popularity of the collars lasted well into the 17th century. (Novgord, plate 17). The collars produced early in this period were simply decorated, but became more and more elaborate toward the latter part. 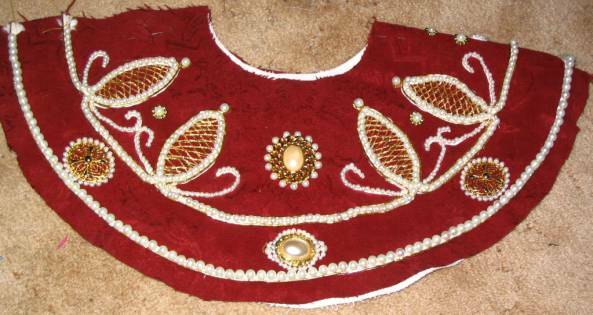 The collar pattern used is a notched circle based on the one found on Sofya la Rus’s website. 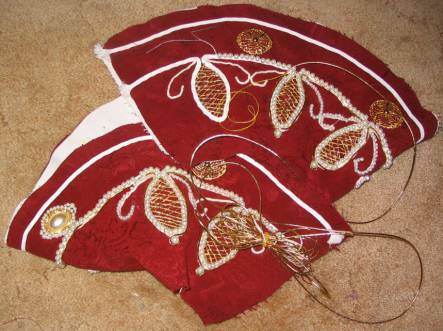 A different pattern, using a full circle, as seen elsewhere, (History of Ukrainian Costume) was not used because it does not sit as well on the shoulders. 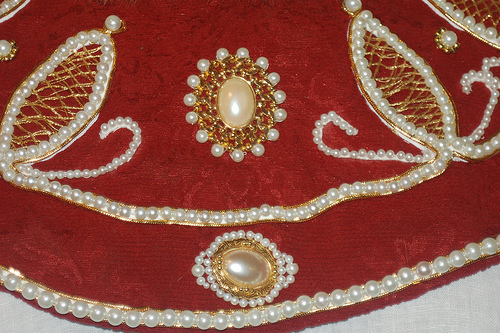 The design for the embroidery was laid out in a basting stitch which was then covered in braid, onto which were sewn the pearls. 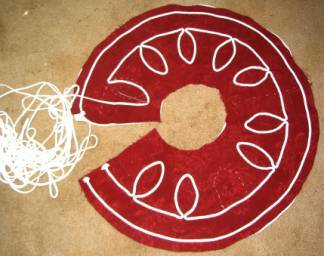 Gold thread was woven to produce a net like pattern within the eye-like shapes. 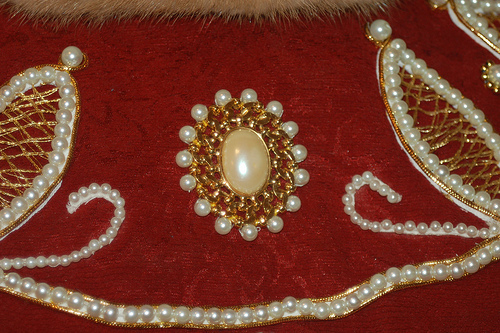 The larger pearl elements were then outlined in gold cord. 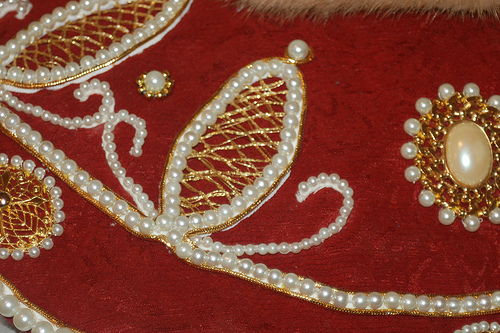 Metal plaques were sewn on and embellished with more pearls. 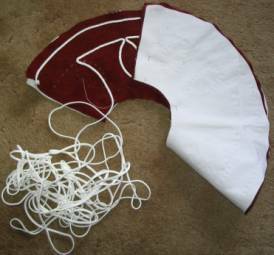 The piece was lined with a non-slip fabric to keep the collar from shifting when worn. 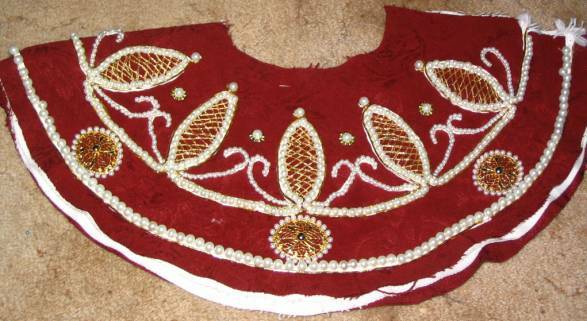 Braid loops and pearl “buttons” were attached to the right shoulder to facilitate dressing. 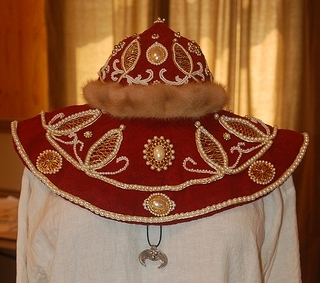 This collar has elements of the 12th century fresco of the prophet Solomon in Saint Sophia’s Cathedral in Kiev (Novgorod plate 25) and because the collar is made as a companion piece to an existing hat, many of the same design elements were used in both pieces. Gormin, Vladimir and Liudmila Yarosh, (Translated by Lenina Sorokina and Carolyn Justice) “Novgorod Art Treasures and Architectual Monuments 11th-18th centuries” Aurora Art Publishers, Leningrad, 1984. Tkach, Yuri ? “History of Ukrainian Costume (from Scythian to late 17th century)” Bayda Books, 1986. 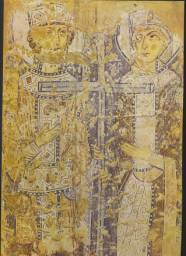 Manushina, T. N., “Early Russian Embroidery in the Zagorsk Museum Collection” Moskva : "Sov. Rossi´i`a", 1983.